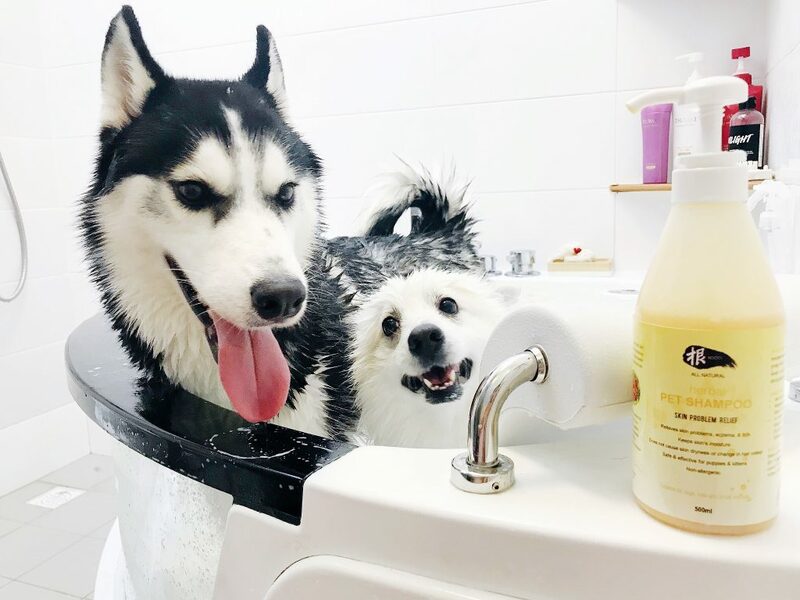 The fantastic team at Roots Technologies saw from the boys’ Instagram accounts that Lengzai was having some “hotspot” issues (fur loss at joints which constantly brush against surfaces) and that Yandao sometimes had skin patches and heavy shedding issues. ..and then they sent over a pretty sweet range of products which we’ll go through in just a bit! Let’s start the journey with a shower and spa for the two boys. 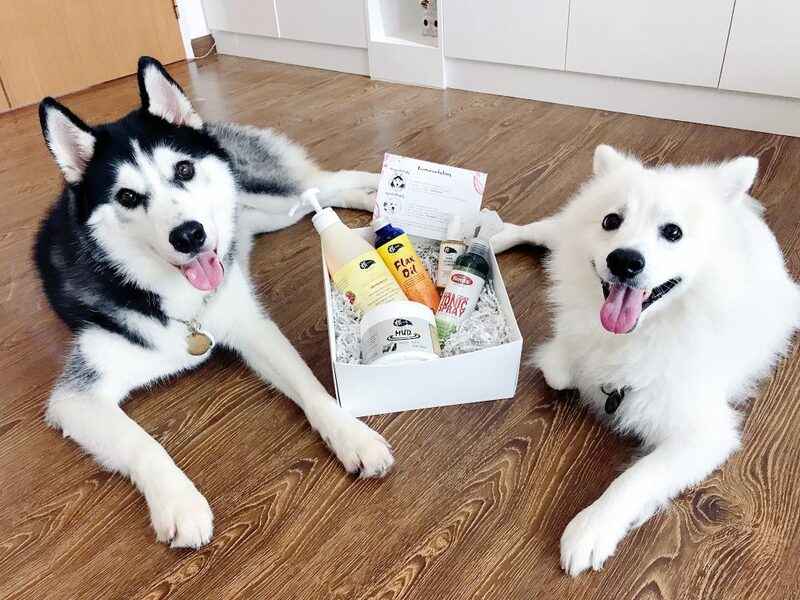 After all, we do want to get the dogs’ smelling fantastic! I kid you not when I mention spa. You now can do this in the comfort of your own home and not necessarily at the groomers’. Woohoo to cost-savings! 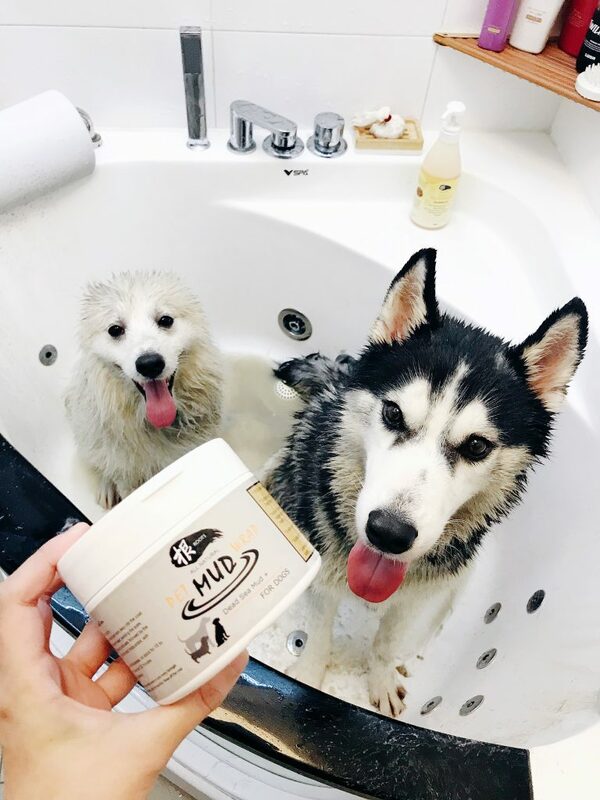 So, what we did was to lather the GEN Herbal Skin Problem Relief Shampoo with water and massage deep into the coats of these two furballs. Lengzai was previously on an antibiotic chemical-based shampoo which was prescribed by the vet, and this smells significantly much better! We then left it on for a few minutes before rinsing it off. 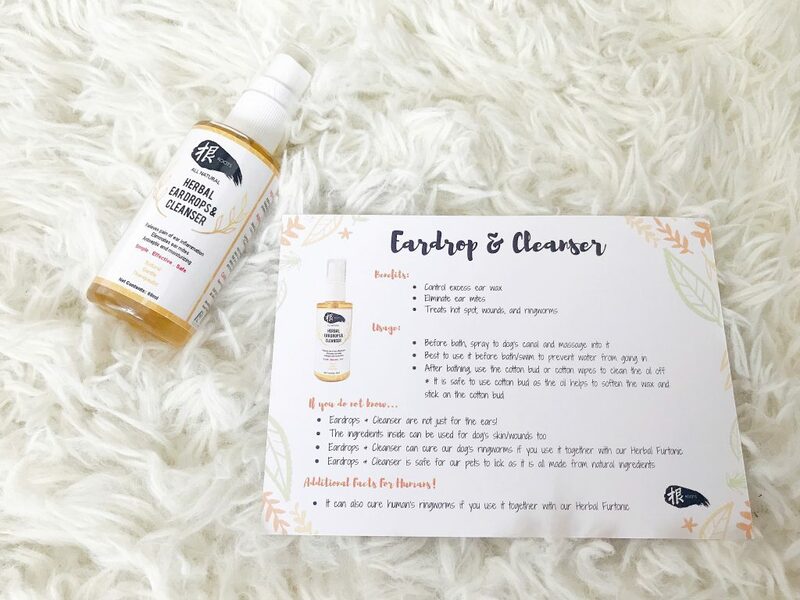 This amazing shampoo is formulated with turmeric extracts, sea holly extracts and phaya yor extracts for various skin conditions such as inflammation, skin irritation, itch and chronic dry skin. Since the two boys were already shampooed and had really wet coats, I applied the mud liberally and worked it deep into their coats. Be warned: This is super messy (but totally worth it). Allow it to sit for 15-20 minutes, and do NOT exceed the timing. Then, rinse it off! You know how your dogs get irritated every time during their bath when water gets into their ears? Before bath (or swimming! 🏊🏻‍♀️), spray some Roots Herbal Ear Drops & Cleanser to your pet’s ear canal and massage into it to prevent water from going in. Having Jojoba oil, this is not only an exceptional moisturizer but also amazing as an earwax softener. 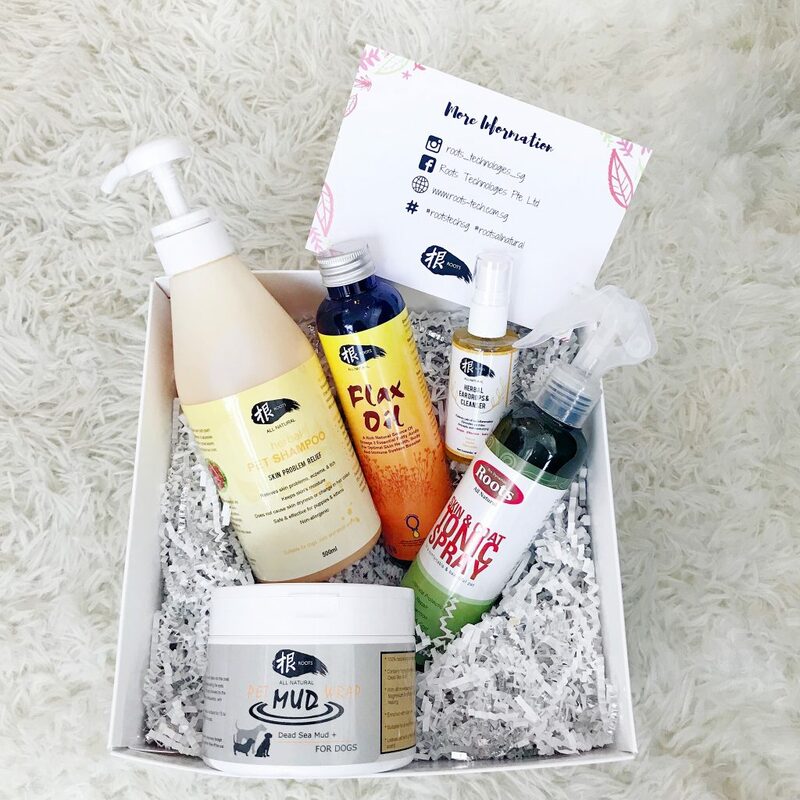 With the additional virgin coconut oil, it also helps in moisturizing and softening skin, reducing inflammation, and supporting tissue healing and repair. Both oils applied topically together with other oils and herbs help to form a physical barrier on the skin to ward off infections, too! 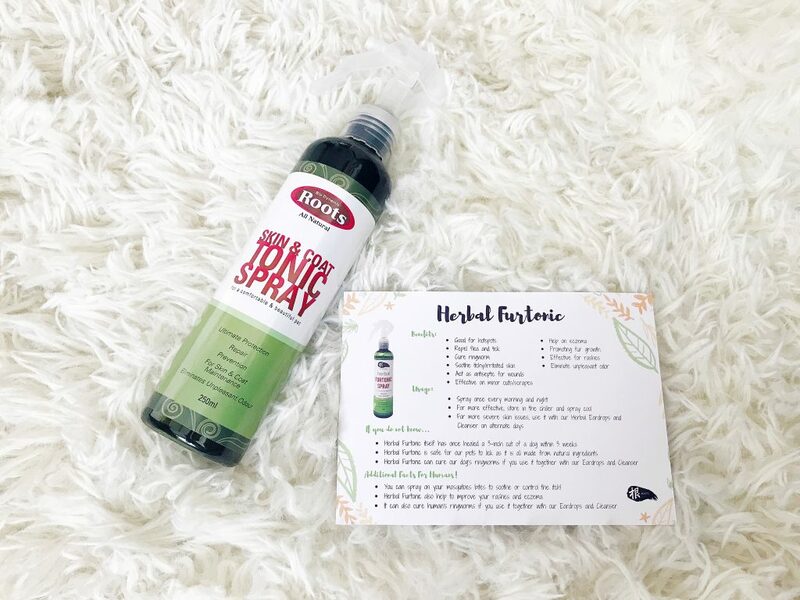 If you have been following me (or the boys’) on Instagram, you would have seen very often on my social media on how I am in love with their Roots Herbal Furtonic Spray. 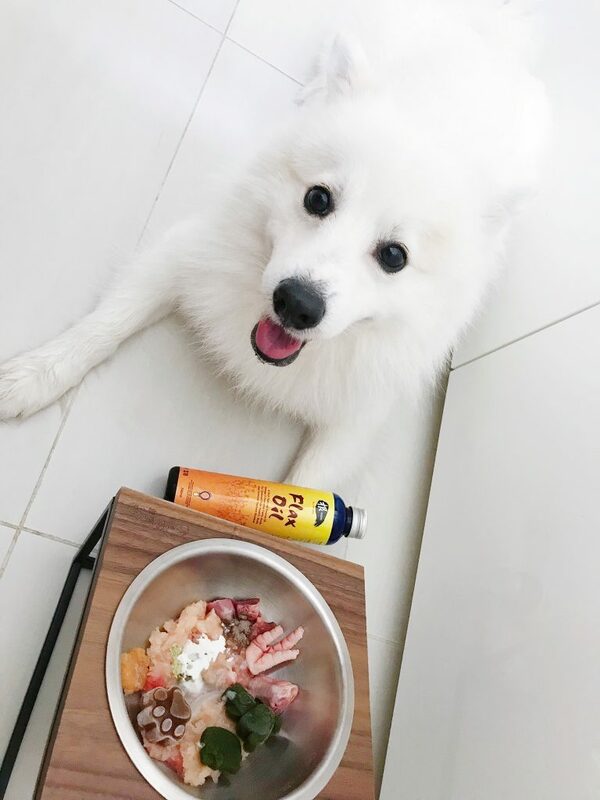 As the name suggests, it’s a tonic spray packed with all-natural herbal goodness that helps in your pet’s skin and coat. It helps to ease and also heal problems such as eczema, rash, skin allergies, abscesses, fungal disorder, inflammation, minor cuts and scrapes. And it’s totally herbal too! It helps to soothe the areas, thus reducing the urge to scratch. This protects the area from getting worse than it already is so as to allow the healing process to take place. For me, I use this very generously on the boys after their daily walkabout sessions (you know lah, the dogs have to walk around the estate just like your MP does) to eliminate any adverse smells (sweat, saliva smells from other dogs, etc). Plus, the fragance also prevents the furry boys from licking themselves. Yandao the Spitz is a well-known vain-pot. He thrives on attention and looking fantastic, because he knows this will lead to pretty girls around giving him loads of love and cuddles. Anyway, Flax Seed Oil is nature’s richest vegetable source and is also said to contain more Omega 3 Fatty Acids than fish oil. This, I add this into the boys’ meal every morning, 1/2 teaspoon for Yandao and 1 teaspoon for Lengzai once a day. One bottle goes a really long way, because the doses are really tiny. Totally worth it! Oh, and do remember to refrigerate after opening. They are indeed two very, very, fortunate dogs….